RHP Eric Cerantola (Oakville, Ont.) should be one of the first players to go on Day III. So who goes first today? Perfect Game’s top 500: 333. Nick Trogrlic-Iverson, Central Arizona, 370. Eric Cerantola, Great Lake Canadians, 407. Michael Brettell, Central Michigan, 440. Denzel Clarke, Toronto Mets, 465. Ben Abram, Ontario Terriers. Baseball America’s top 500: 321. Eric Cerantola, Great Lake Canadians, 356. Michael Brettell, Central Michigan 383. Denzel Clarke, Toronto Mets, 441. Ben Abram, Ontario Terriers. MLB.Pipeline’s top 200: 189. Eric Cerantola. Troubadour sings Goodbye to touring: Day III of the draft always drags. No more so than in 2014. You think high schoolers and collegians were impatient. I was tapping my foot like Brett Lawrie waiting to get in the game as we moved -- slowly -- through the 37th, 38th and 39th rounds. The Blue Jays were shut out by Shelby Miller of the St. Louis Cardinals who threw a complete-game, three hitter at the Rogers Centre. Meanwhile in Arlington, Tex. the Cleveland Indians beat the Texas Rangers 8-3. Yan Gomes and Carlos Santana went deep behind Josh Tomlin. I was in the same area code. And as soon as the Chicago White Sox White Sox selected OF Julian Service (Whitby, Ont.) from the Howard College Hawks in the 40th round, 1,188th over-all, I hit the send button and was gone. Then, it was off to see George Strait’s final concert at the space ship known as AT&T Stadium. He brought some guests Sheryl Crow, Faith Hill, Miranda Lambert, Martina McBride, Asleep at the Wheel, Jason Aldean, Kenny Chesney, Eric Church, Vince Gill and Alan Jackson. It was a day he sang The Cowboy Rides Away for a final time in concert, although he does do shows in Vegas now. 12:31 PM Another one? _ The San Francisco Giants selected CF George Bell from the Connors State Cowboys in the 13th round. He is the son of George Bell, the first Blue Jays AL MVP winner in 1987, edging out Hall of Famer Alan Trammell in the voting. Bell used to work for the Jays until one spring he showed in Dunedin and was told “ah, sorry, we don’t have you in the budget.” Bell was out of town the same day. He was re-hired when president Paul Beeston returned as president. He participates in Blue Jays Academy events with former players like Duane Ward and Lloyd Moseby. 12:40 PM Padres jump into the pool: The San Diego Padres chose LHP Erik Sabrowski (Edmonton, Alta.) of the Cloud County T-Birds in the 14th round. Sabrowski earned multiple honours as he was named a First-Team All-Conference, the KJCCC West Pitcher of the Year, and First-Team All-Region VI. The 6-foot, 4-inch left-hander put together a dominating sophomore season that saw him finish 7-2 overall with a 3.14 earned run average — 1.56 ERA in conference play — and 117 strikeouts in 66 innings pitched. His 117 strikeouts are a school record and the fifth-best mark among all NJCAA pitchers this season. In addition to being Cloud County’s ace, Sabrowski, who was also voted KJCCC West Honorable Mention as a designated hitter, proved to be a dual-threat in the heart of the T-Birds’ order, finishing with a .355 batting average and leading all Cloud players in home runs (11) and runs batted in (58). 12:52 PM: Cards know pitching: With their 15th pick, the St. Louis Cardinals chose RHP Michael Brettell (Fonthill, Ont.) of the Central Michigan Chippewas. Brettell is a Great Lake Canadians grad. Okotoks Dawgs double duty man Kody Funderburk was chosen in the 15th round by the Minnesota Twins. Next, an Okotoks Dawg: The Minnesota Twins selected LHP Kody Funderburk, from Dallas Baptist. Funderburk has spent his summer pitching for the Okotoks Dawgs in the Western Major Baseball league. And next in a three-player run of players with Canuck connections: The Milwaukee Brewers chose RHP Nick Trogrlic-Iverson (Oakville, Ont.) of the Central Arizona College Vaqueros. 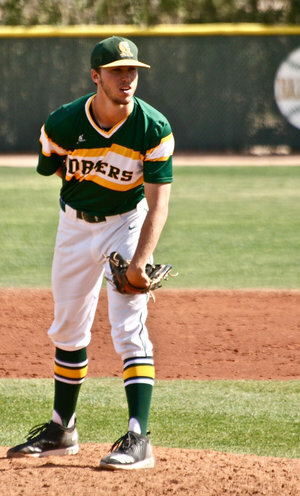 Trogrlic-Iverson pitched his final year before going to school with the Langley Blaze. He STILL has eligibility remaining: The Milwaukee Brewers drafted LHP Clayton Andrews with their 17th pick from Cal State Long Beach. 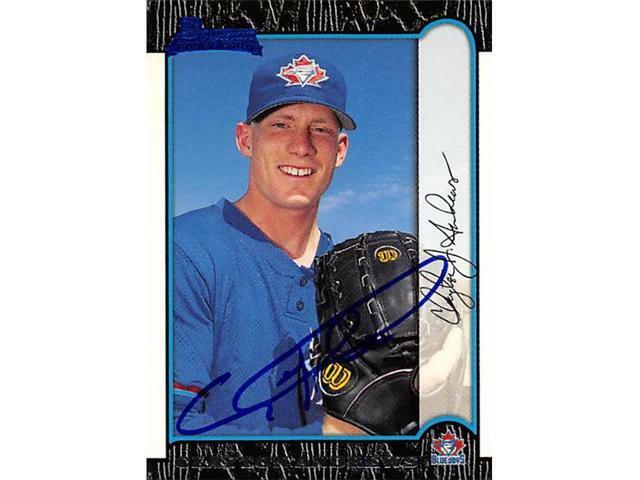 This Andrews is not to be confused with the LHP Clayton Andrews, of Seminole, Fla. who pitched in eight games for the 2000 Blue Jays and manager Jim Fregosi.
. • Pitchers were the most frequently chosen. There were 653 selected (500 RHP, 153 LHP). The rest of the 2018 pool was comprised of 230 infielders (100 shortstops, 50 third basemen, 40 second basemen, 31 first basemen and nine utility infielders), 215 outfielders, 115 catchers and one utility player. • The University of Kentucky had 13 players selected, the most in the Draft. Three schools – Texas Tech University, the University of Arkansas at Fayetteville and Wichita State University – each had 11 drafted. The University of North Carolina at Chapel Hill and the University of South Carolina at Columbia each had 10 players selected, while the University of Oklahoma had nine players taken. Five schools produced eight players -- Tennessee Tech University, the University of Arizona, the University of Louisville, the University of Mississippi and Vanderbilt University. • Players were selected from 47 states, with Alaska, Maine and Montana being the states to not produce a draft selection. The states that had the most players selected were California (187), Florida (158), Texas (114), Georgia (65), North Carolina (49), Illinois (39), Ohio (34), Arizona (31) and Pennsylvania (31). A total of 54 draft eligible foreign-born players were selected in the 40 rounds, including 30 players from Puerto Rico; 21 players from Canada; and one player each from the Bahamas, the Dominican Republic and the Netherlands. • And Michael Menhart (40th round, WSH), son of former ajor Leaguer and current Nationals Pitching Coordinator Paul Menhart.